Summary in English of God's Grandeur. 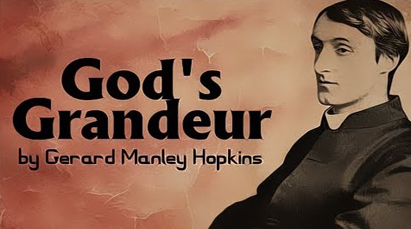 God’s Grandeur is a fine religious poem written by Gerard Manley Hopkins. Though Hopkins lived and wrote in the 19th century, he is one of the leaders the modernist movement in poetry. His poem too, were published in the 20th century, first by Bridges in 1918 and then by Charles William in 1930.Hopkins was influenced at oxford by john Henry Newman and he converted to Roman Catholicism in 1866 and became a Jesuit two years later. God's Grandeur is a sonnet ( a poem in fourteen lines ) praising the greatness of God. The world is full of God's glory ( महिमा ). It shines with God's grandeur ( भव्यता ). God's Grandeur expresses itself in two ways. Sometimes it bursts out with a sudden radiance just a shining and shaken sword radiates brightness and secondly it menifests ( व्यक्त गर्छ ) itself slowly over a period of time just as oil slowly leaks or flows from on olive seed when crushed and gathers itself into a large amount. In the same way, God's glory pervades ( सबै ठाउँमा व्याप्त छ ) everywhere in the world. The poet wonders if the world is full of God's grandeur, then why people do not pay attention to the command of God. The reason for this ignorance and indifference ( वेवास्ता ) is that the people of the world have become too materialistic ( भौतिकवादी ). They have become slave to the matter and pursue their profit earning activities without caring about God's will and anger. As a result, their senses have become so numb (संवेदनहीन ) that they are unable to realize the omnipresence ( सर्वव्यापी अस्तित्व ) of God. The world has degenerated. Nevertheless, God's greatness shall never diminish. Despite our misbehave towards it, the nature and the resources are in large quantity. The world's filled with the god's greatness, the Holy Ghost broods over everything. As long as the mercy of God is on us, we are safe. 0 Response to "Gods Grandeur | Summary"